As the official representative of Dubai Lynx in the UAE, Motivate Val Morgan strives to bring you the latest news from the desks of the Festival. 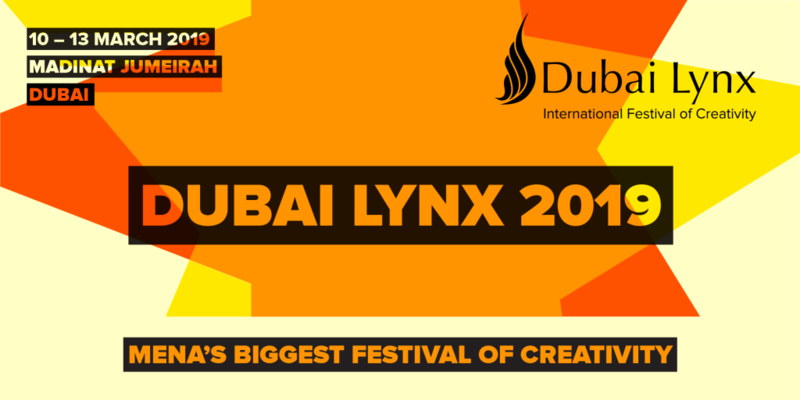 Dubai Lynx – MENA’s biggest Festival of Creativity, will return to Madinat Jumeirah from 10 –13 March 2019 with a programme of events that will explore creativity in all its forms. The festival has a slick new, streamlined format in 2019. The two-day programme will reduce the time spent away from the office while maximising value for delegates attending the festival. The festival kicks off with a launch party followed by two days of fantastic content, world-class speakers and unparalleled networking opportunities. On the last day of the festival, the region’s best work will be awarded and celebrated at the Dubai Lynx Awards Show. The agenda will dissect new trends, question how to make creative work effective and inspire the next generation of cutting-edge ideas. With three stages running through the Festival, there is something for everyone to see. The deadline for submitting a proposal to speak at Dubai Lynx 2019 is 1 November 2018. Click here to download the Call for Content guide. Please Note: there is no fee to speak at the Festival; session hosts will need to cover the cost of their guest’s accommodation and travel. Senior marketers can meet their peers and advance their craft at a curated programme for top-level marketers, featuring bespoke training workshops, roundtables and small intimate discussions with global marketing leaders. Email or call +971 (0)4 427 3090 for more information. Roundtables: throughout the festival, Dubai Lynx will host C’Suite only roundtables for CMOs, CCOs, Agency Heads and more. These exclusive, invite-only roundtables are an opportunity for industry peers to convene and create real action based on industry challenges and opportunities. Lynx Alumni: Dubai Lynx is proud to launch its Alumni Club for all previous winners of the prestigious Advertising Person of the Year award. Hear these talented leaders speak and gain great insight into the industry. In addition to community meetups and evening functions, join speed networking events and use the festival app for connecting with other delegates and speakers. Four Young Lynx Competitions attract teams of copywriters, marketers and art directors, PR/communications professionals from agencies and client companies, below the age of 32 years, across MENA. Entrants must produce an original campaign in response to an NGO brief in just 24 hours at the Festival. Dubai Lynx Student Competitions are open to full-time undergraduate students between 18-25 years studying advertising, marketing, PR, media, graphic design and other relevant creative communications fields. The competitions aim to develop and showcase the region’s up-and-coming creative superstars with four exiting initiatives. Witness the launch of Glass: The Lynx for Change – an award honouring work from across the region that addresses gender inequality or prejudice through conscious representation. Branded Content & Entertainment to become the Entertainment Lynx, with new sports-focused categories. Interactive to become the Digital Lynx with some revamped categories. Promo & Activation to become the Brand Experience & Activation Lynx with updated categories and sections. New Applied Innovation section added to Innovation Lynx. Copyright © 2019 Val Morgan Cinema Network.